In 2015, right before some of the darkest days of my life would unfold, the Lord was preparing my heart. 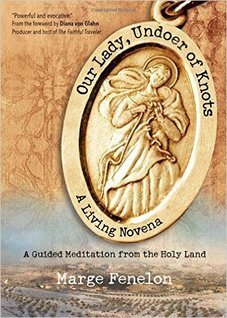 I had received Our Lady Undoer of Knots: A Living Novena by Marge Fenelon from Ave Maria Press. These 9 days praying with the Blessed Mother would prove invaluable as our finances crumbled, we lost people we loved dearly, and our children faced personal trials. I woke bright and early to read chapter two while walking on the treadmill. Thank you Ave Maria Press for making this a small sized book! Then it wasout into the yardfor the Rosary. I walk a path around the parameter of my yard. There are some advantages to living on a fork in the road. There is lots of pavement to walk upon. Unfortunately for my husband, I do have to traverse one patch of grass crossing my backyard. My husband, very protective of his lawn, is very stressed about the path I am wearing in the grass. It reminded me of that old adage about wearing out a path in the carpet pacing; I am wearing out a path in the yard praying — which is how I worry. The walking and praying works best for me because I am so easily distracted inside – phone, television, dishes, kids, the PILES of work that surround me!! Outside, I forget it all and just walk – and talk (with anyone in heaven who will listen) and of course, I am also sure to listen as well. ​ The Rosary provides a hum in my head that clears the way for God to speak. 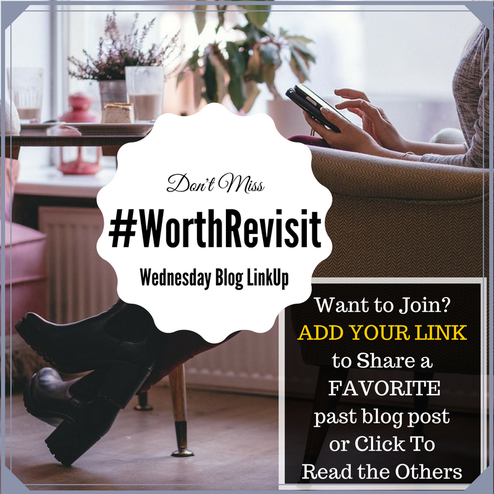 Today my mind was drawn in a few directions – mostly to friendships forged in faith that ended far too soon – the reasons moot to the eventual outcome. It has been many years but they still enter my thoughts and prayers often. I don’t seek reconciliation, part of wisdom is knowing when the season for something has come to an end. However, the pain of the separation and the “what ifs” sometimes still prevails in my thoughts. The other surprise insight from today’s walk came when the Holy Spirit revealed to my heart the power of my own fears and doubts to drown out the peace the Lord longs to give me. I separate myself in sin, of course, but beyond the things that I do, are the things I do not do. 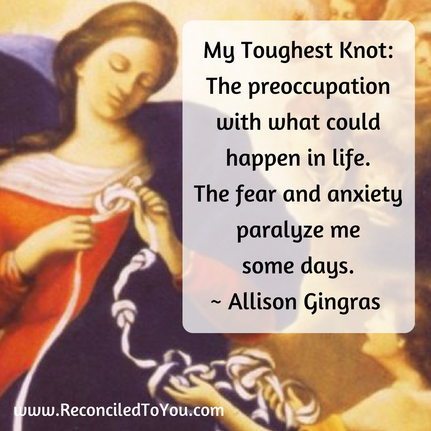 The preoccupation, fear, and anxiety with what could happen in my life paralyze me some days. My lack of trust in God is manifested in my refusal to truly believe he is love. My struggle to accept the truth that he orders everything in my life from his love an for my good, regardless of the circumstances. Even after witnessing the fulfillment of his promise to bring good in all circumstances, I still live in a constant battle between peace and paralyzing fear. As I pondered all these things, my Rosary ended which is usually when I walk into the house. The concluding prayers had even coincided with me reaching the front door. I felt a nudge to go for one more circuit around the yard. As I rounded the corner to begin another loop, a car drove pass with the license plate, “KNOT 5!” Honestly, I can’t make this stuff up! For some unknown reason, instead of being moved to peace by this remarkable coincidental moment (which I dub a “godcidence” moment); it instantly brought me great dread and fear. Already battling a panic attack for the day this incidence was not helping! Was this a message from above? I mean come on — I’ve been walking this loop now for 2 months and first I’ve seen that plate!! I came in an picked up the book I am using for my 9-day novena, Our Lady, Undoer of Knots: A Living Novena, and looked at Day 5. Lord, Sweetheart, THAT IS NOT going to help me feel less anxious and more secure in our relationship! **2018 Update: I had every reason to dread, many difficult days would lie ahead including the passing of my Father in Law, although not a surprise, he was already on a decline the day of this walk; but there would be an unexpected passing; along with some very difficult family circumstances to navigate. In the end, I was actually very grateful for a little heads-up but more importantly the prayer preparation to carry me through those dark days. Do you have a knot you need the Blessed Mother to untie?